On May 18th, Morning Musume members Niigaki Risa (5th Gen) and Mitsui Aika (8th Gen) will both be graduating at Budokan, taking away two of the most dedicated and loving members of the group. With this, Morning Musume will become a 10-member line-up. When I first heard the news that Niigaki Risa would be graduating so soon after Takahashi Ai, I was pretty devastated. She had always been one of my top members, my girl crush and the person I recognised as a true 'Musume'. She was the one I looked up to, and the one that had made me into the fan I am today. So of course, I was sad. I adore, respect and love her so much as an Idol that I bought her last photobook. That is how much she means to me. And then, when the news that Mitsui Aika would graduate on the same day came about, I was shocked, sad, angry... I honestly didn't know what to feel, though later on, it boiled down to mostly anger and absolute devastation. But, it also made me realise how much I liked Aika as well, and how much I did not want her to graduate, which surprised me, because before, I had been so set on her graduating to focus on her health despite how much I liked her. After this news came out and various other bloggers wrote about their feelings on the matter, I started to realise how similar these two girls are. They both love and adore Morning Musume, and are so reliable and work so hard for the group that they love. Whilst neither have ever been the most popular members in the group, they both strive to make Morning Musume the best that it is, and want what is best for the girls who are a part of it. And then I realised how right it seemed that they graduate together, because they are both the strongest members of Morning Musume in terms of how they feel about the group, and what it means to them. And that is what makes me sad that these two are leaving - These are the two most dedicated and loving members of such a great group. They have dedicated themselves to Morning Musume since they joined, and have always given their all. Mitsui proved that she loved Morning Musume and devoted herself to it when she injured herself. Even though she could do so little, she did whatever she could to help everyone out and to still be a part of the group. And Gaki - you just have to looks at her and how she acts around the group to know that she loves it. She has loved Morning Musume since the day she joined, and will most likely continue loving the group after her graduation. I guess this is what makes it so right that these two are graduating - okay, Aika's graduation is so sudden, and so unprepared, but I think that if I had wanted her to share a graduation with anyone, it would have been either Ai or Gaki, because she and Gaki are so much alike in terms of how leader-like they are and how dedicated they are to the group, and Ai because they were pretty close. So, whilst I was annoyed, angered and sad by the fact that she would share her graduation earlier, I do take it back a little. Honestly, I would have preferred that she have her very own ceremony, but her being with Gaki also feels right, it feels like it was meant to be for them in a weird way. Two dedicated and loving girls, going out together. I just really hope, wish and pray that Aika will get the spotlight she deserves, and won't be overshadowed too much by Gaki, because I have a feeling that Gaki would not want that, and neither would the other members. These two are the girls who really stick out to me the most as the ones who truly do love and care for the group. 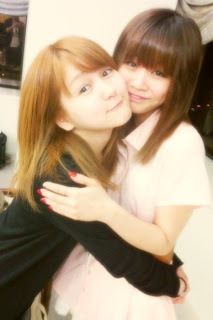 These two put their all into Morning Musume, and you can clearly see that they adore the group with all their heart. They work hard, and they just dedicate themselves. Poor Aika, despite being injured, did what she could for the group and didn't give up until she really needed to - and even now, she is staying in H!P - she is probably one of the most dedicated Morning Musume members I have ever had the pleasure of watching. She is just so devoted to the group that she loves, and I expect that, even after graduation, she will still devote herself to the group no matter what. When their graduation day comes, I hope that the entire concert hall will be lit with Green and Purple lights, and that these two will shine in their own way, because these two girls honestly deserve the best graduation that they could possibly have.